Costa Rica is a county that is well known for its amazing natural wonders including a lush and lavish rainforest, making it a popular stop on many Western Caribbean cruises. The country boasts an abundance of natural parks; and, housed within them lies one of the most varied collections of plants and animals in the entire world, with nearly a thousand different species of birds alone. It is not a wonder then that outdoorsy and adventurous Limon Costa Rica cruise excursions welcome guests traveling to this area. From exploring the environment on jungle tours to getting wet and sampling the immense biodiversity in the waters at the coast, there is something for every thrill seeker to do while ported on cruises to Costa Rica. Although there are a great many things to do in Puerto Limon whether you are there for an adventure or a relaxing stop in tropical paradise, the thrill seekers really luck out in this area, benefiting from exciting Limon Costa Rica cruise excursions that can be done nowhere else. We have put together a list of the best five that are sure to get the adrenaline pumping! 1. Aerial Tram: Those that are afraid of heights will want to avoid the aerial tram at all costs, however for the brave, a ride on these gondola – like carts coasting high above the jungle floor is an utterly breathtaking experience. Guides fluent in English give up to five guests the tour of a lifetime over multi acre nature preserves in their quiet and slow moving carts. Although not a high speed ride, these adventure tours are not for the faint of heart, they are strategically designed to give guests a bird’s eye view of the rainforest and deliver in every way. The Aerial Tram is one of the most popular Limon Costa Rica cruise excursions, and with very good reason. 2. Caving: Because much of the natural beauty of Costa Rica has been left untouched by modernization, it is home to some of the very best caving in the world. Many of the caves here at one time resided deep underwater, making them particularly curious to explore from dry land. Exotic animal species like mustached bats can be found, as well as the sea based remnants from time past, like shells embedded into cave walls. These Limon Costa Rica cruise excursions require high energy and some skill, but for seasoned spelunkers, the tours can not be beat. 3. Bungee Jumping: There are plenty of places to bungee jump – it is even a roadside attraction in some parts of the world. But, bungee jumping in Costa Rica is like nothing guests have ever experienced before. Some of the highest jumps in the Western Hemisphere can be found in Costa Rica, and believe it or not, this attraction is not a horribly expensive activity (although it is one of the briefest) priced between $50.00 and $75.00 per jump. Adventure seekers aboard Western Caribbean cruises stopping here will do well to make sure they schedule this vertical adventure, truly one of the most exciting of all Limon Costa Rica cruise excursions. 4. Extreme Canopy Tours: Costa Rica shares the unique distinction of being the original home of one of the most exciting and exhilarating experiences in the Americas. 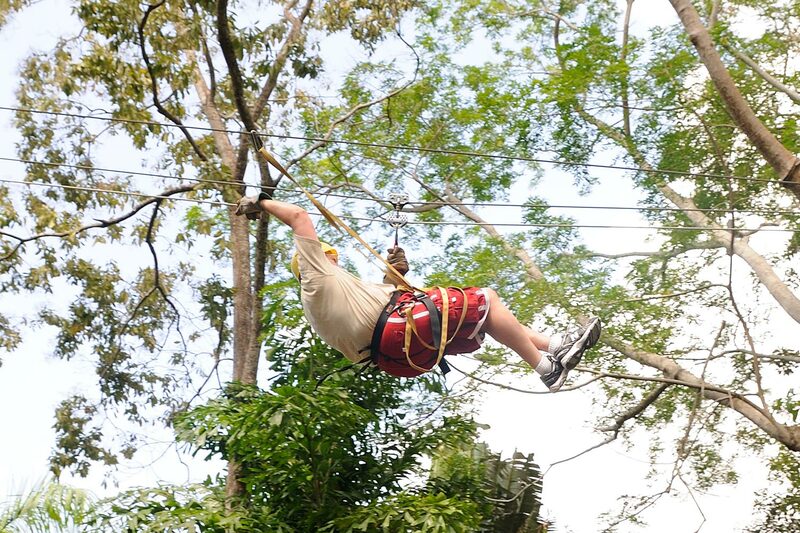 The term “canopy tour” may sound like just another zip lining adventure; however it is far from it. Zip line tours feature cable lengths that are studded through predetermined paths in the jungles and rainforests where guests glide gently from one to the next. Conversely, these canopy tours allow guests to channel their inner Indiana Jones or Tarzan for a tree to tree adventure that offers the safety and security of zip lining but in a more daring light. These Limon Costa Rica cruise excursions have become so popular that they are springing up in other tropical locations found along Western Caribbean cruises, and are without a doubt the best way to truly appreciate jungle surroundings. 5. Scuba Diving: The amazing animals that fill the clear waters off the coasts of Costa Rica may be an important part of Caribbean cuisine, but they are as important to a well rounded trip to this part of a world while they are still alive as they are when they are cooked up on a dinner plate. Although the Pacific side of Costa Rica (near Coco island) is the best known scuba diving haven for visitors to the country, the Caribbean side also offers many exciting scuba based Limon Costa Rica cruise excursions for guests to enjoy. Reef gardens boast over thirty different kinds of corals like exotic brain and bright fire. And, octopi are found in the region, which are almost as exciting to encounter as the giant rock lobsters. Fishes ranging from the edible to the beautiful to the bizarre can be found at over ten different dive sites on the Caribbean side providing an awe inspiring, adventurous tour through a wealth of biodiversity. There are multiple different choices in scuba Limon Costa Rica cruise excursions to choose from so that divers of varying skill sets and experience levels can take part in the fun.